How did you come up with your derby name? Have you seen me eat? I LOVE eating and my appetite is voracious. Most of my happiness involves food and if my appetite is satisfied, which is difficult at times, it’s complete bliss. The most rewarding aspect of playing the game is to see what you are capable of accomplishing on the track. Skaters invest a significant amount of time training. It’s truly amazing to see how their hard work transpires during gameplay. Is there anything you're scared to try? To be very honest, I’m pretty nervous about everything I try to do in my skates. I just don’t think I show it. I try to overcome my fears by focusing on what I’m trying to accomplish and practicing as much as I can. As much as I love eating, I also enjoy cooking when I have time. If you could choose one skill in roller derby to perfect in an hour, what would it be and why? Landing an apex jump inbounds because it requires less energy than trying to break through a wall of blockers. If you could go back and talk to yourself as a newbie skater, what advice would you give her? Be patient and stay positive. I think when most people start roller derby, they are very motivated to play the sport. However, they may not be cognizant of the time it takes to be comfortable in your skates as well as the time it takes to learn the skills, strategies and rules. 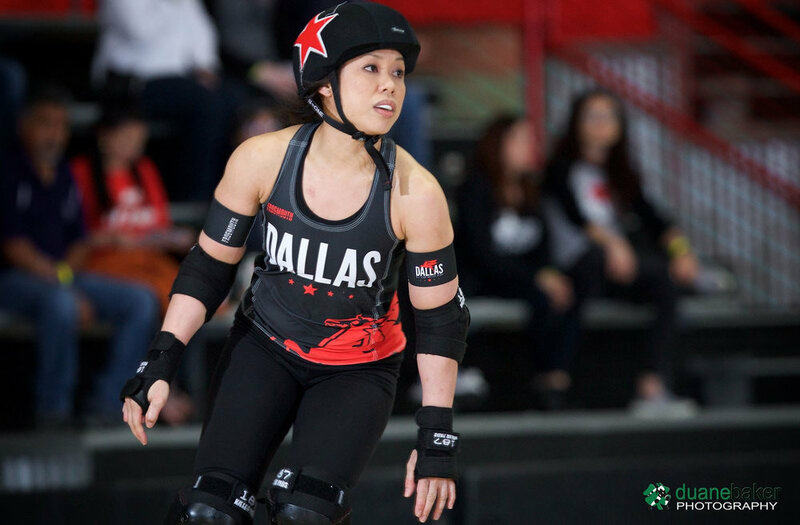 Having patience with yourself to learn the various aspects of derby can help with developing a positive perspective of how you will grow into the skater you want to be. Also, don’t be hesitant of asking veteran skaters for help and advice. They have been where you are now and are likely more than happy to share their skills, knowledge and experience.